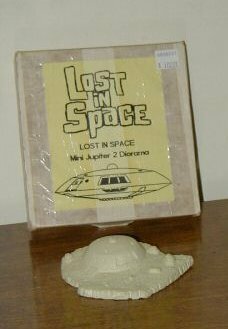 This is a miniature replica of the Lost in Space Jupiter-2 crash site. This piece was made of polymer and hand carved right down to the smallest detail. The interior including the port hole, and inner dome have been painted with a special glow-in-the-dark paint and will illuminate at night making the ship seem occupied. 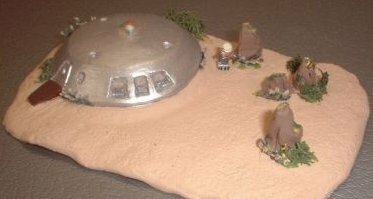 The dome is made of clear plastic as well as the Jupiters windows. And it doesn't stop there !! Theres also a micro sized Robot that has glowing effects! The length and width of the site measures approx. 4 X 2 1/2 inches. Lifelike plant life surrounds the ship and rock formations giving the grounds a certain realism. 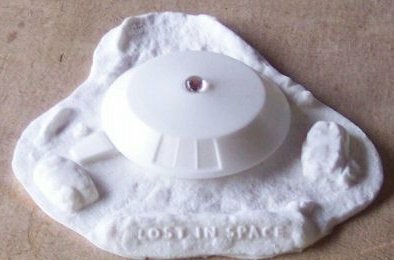 This crash site is a one-of-a-kind sculpture and cannot be bought anywhere! Remember that this is a handmade item and will have minor flaws such as a trace of fingerprint or glue residue, although .. this particular creation is very clean. Because of the time and patience involved in this project. Another creation by Benj Pezzolla!